When I heard that we were going to do an episode in New York, I immediately assumed we'd be up in the Adirondacks, probably near White Hall, NY. Much to my surprise, we were to be further to the south in the Catskill Mountains. There are fewer reports from this area, but that doesn't necessarily mean there are few sasquatches. It could be that the bigfoots that are living in the Catskills are a bit more wary than their northern cousins, or even that there are areas in the Catskills where fewer people go. After all, you need both a bigfoot and a human in order to have a bigfoot encounter. Either way, I loved the idea of breaking new ground and doing my first expedition in this part of the state. Our first stop was to do a recreation of the famous New York Baby Footage, taken by Doug Pridgen back on May 23, 1997. The footage shows Doug and his buddies around a campfire goofing around, but in the background one can make out an upright, bipedal figure moving along the base of a tree. At one point, a small ape jumps off the shoulders of this figure and makes its way up into the branches of the tree and swings around in a very dexterous manner. Its movements are undeniably apish, and clearly outside the abilities of any human. The New York Baby Footage from Steve Kulls' Youtube page. Steve was the original investigator of the footage. The footage was obtained on accident as Doug filmed his friends around a fire at a music festival on a parcel of private land. It was Friday night and Doug and his friends took a remote campsite on the other side of a large pond. As more concert-goers arrived, the campsites on the close side of the pond filled up, but only one other group was camped on the far side where Doug and his friends had set up camp, and they were the property owners. When the footage was obtained, the property owners were not in their camp, but were on the other side of the lake enjoying the concert. 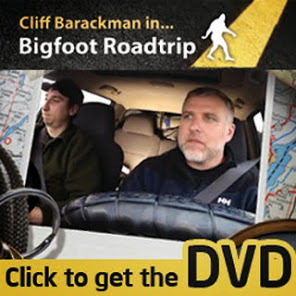 Read the rest of my field notes on the NY episode of Finding Bigfoot at the Official Cliff Barackman website. I wish Bobo could have been there to give a height comparison from ground level up, that is, the height of the walking biped. Also, I am amazed that something swinging in the tree immediately calls to mind a Bigfoot baby, I always thought they were more at home on the ground? Usually tree dwellers have disproportionately long arms right? Does Bigfoot have that sort arm to body ratio? I feel kinda funny playing the devil's advocate since I am usually the one waving the Bigfoot banner, but its just not the usual behavior I am used to hearing about. Anyway, I enjoyed the episode, and am SO HAPPY you guys are back on the air! that was too long to wait! Congrats. That was a fantastic episode. I can't wait to cover the other exciting places you trek around this season! I find the New York Baby footage interesting After viewing the TV segment on this topic, I feel at the least the swinging subject would be a sort of primate to the actual sight of a Squatch. Strong possibility. Perhaps the dumbest show on television. (Okay, that is a bit much. We do have the Jersey Shore). He should his last name to Claven since the show reminds me of Cliff Claven if he went on a Bigfoot hunt. I wonder if they're not in the trees more than you would think. I would start checking the trees too.. I enjoyed the show. I am looking forward to see what happens while you were in my Mother's home state of Rhode Island and all the up and coming episodes. What makes this footage so believable is the fact that the individuals involved did not try to make a show of the clip and say it was Sasquatches.They didn't even see them for a long time.The baby looks so carefree!I still am shocked they would frolic so close to the loud music, cars, and people at that concert,though. So glad your team chose this clip to highlight.It's great!